During the 2018-2019 school year, the library media department will be making a concerted effort to provide all WCPS students with coding, robotics and computational thinking opportunities. For students in PK-5, this will occur as a part of their regularly scheduled library periods. For middle and high school students, it will occur as a part of and integrated, enrichment or club-based opportunity. Determine sources from which you will collect data, and decide which qualitative and quantitative data to collect. Produce and evaluate charts, and use appropriate statistical methods to test a hypothesis. Identify patterns to make predictions, create rules and solve other problems. Take large complicated problems, and break them down into manageable pieces. Identify similarities and remove details to create a solution that works for many different problems. Test, tweak and refine an object before building it in real life using design software to predict outcomes. Create solutions using step-by-step instructions that operate like a road map for performing a task. Conceptualizing, not programming — Basically, computer science is NOT computer programming. Coding is simply one expression, and a limited one, of computer science concepts and problems. Fundamental, not a rote skill — A rote skill is mechanical, something repeated over and over. Computers are brilliant at rote tasks. A fundamental skill is a skill every person needs to know (or should know) to participate in society. A way that humans, not computers, think — This is perhaps the neatest insight about computational thinking: it’s a way human beings think about the world and its problems and how we might solve those problems. Computers, in contrast, are more rigid and limited. Humans are clever and daring. Complements and combines mathematical and engineering thinking — Computational thinking includes math and engineering. It’s not a subset of either discipline. Computer scientists leverage math and engineering to develop solutions that may go beyond the limits of either way of thinking. Ideas, not artifacts — Computational thinking is not about output, a smartphone or the Watson computer. It’s the ideas that inform our technology and lead to their creation. For everyone, everywhere — Computational thinking is available to all people, whether they use technology or not, whether their solutions require technology or not. This website full of resources that take computer science concepts out of the computer lab and into real life. Google offers a robust selection of courses and lesson plans designed to help educators and students strengthen their computational thinking skills. 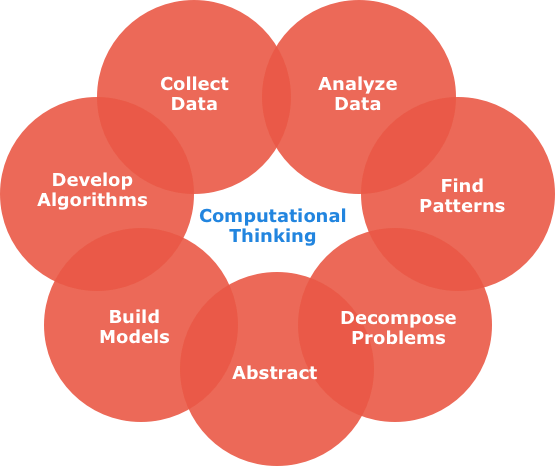 The several short videos included in the Exploring Computational Thinking curriculum are excellent supplements to classroom activities and lessons that are based on computational thinking principles. The Lifelong Kindergarten group of MIT’s Media Lab created Scratch, a coding platform geared toward younger coders. By using a drag-and-drop block style, students can create animations, games and simulations without any previous knowledge of computer programming. Thingiverse is an open-source library full of blueprints for CAD and 3D printing software. This online platform makes it easy to integrate 3D modeling into your classroom as students have the option to tweak and refine existing models instead of designing from scratch. TinkerCAD is a flexible platform for building all kinds of 3D prototypes, from interior design mockups to video game characters. TinkerCAD is available on both web and app platforms, making it a great choice for a classroom with a variety of tech devices. TinkerCAD makes digital drafting easier and is suitable for students from elementary school all the way through high school. 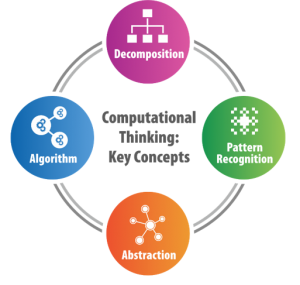 The Wolfram Computational Knowledge Engine directly connects computational thinking with all areas of the curriculum. This special search engine shows how computational thinking can help us decompose information in order to find the best solutions to problems. The UCI Machine Learning Repository is a database full of almost 400 machine learning datasets. These sets span everything from forest fires to poker hands. By looking through these databases, students can develop an understanding of how computers recognize patterns and get better at sorting data over time.